Investors directed sizable investment fund flows towards equities for the week ending 9/19/2018 as reported by the Investment Company Institute (ICI) on 9/26/2018. Total equity inflows for that week equaled $10.2 billion dollars. 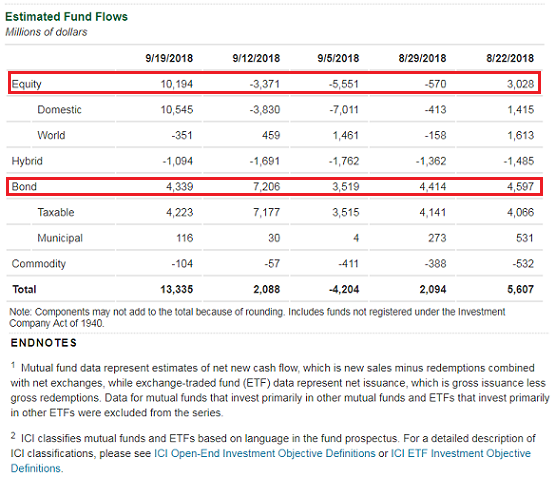 This completely reversed the $10.4 billion net outflows reported over the prior seven weeks that ended 9/12/2018. Bonds continue to receive inflows as well and equaled $4.3 billion in the week ending 9/19/2018. Bonds have had positive inflows in the prior seven weeks and on a monthly basis, the last net out flow for bonds was in the month of December 2016. One week does not make a trend; however, this reported flow into equities is worth watching to see if similar or at least positive flows are sustained into subsequent weeks and months. I have recently reported in a few earlier posts that positive business and consumer sentiment remains at or near record levels too. 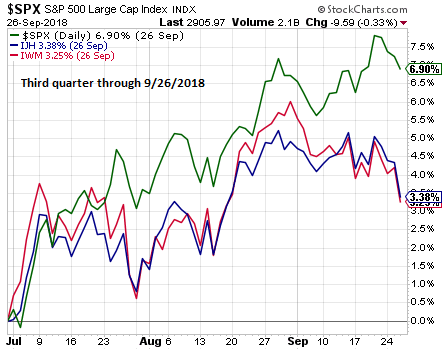 In regards to investment sentiment it currently is neither overly bullish or overly bearish in spite of the positive U.S. equity returns so far in the third quarter. 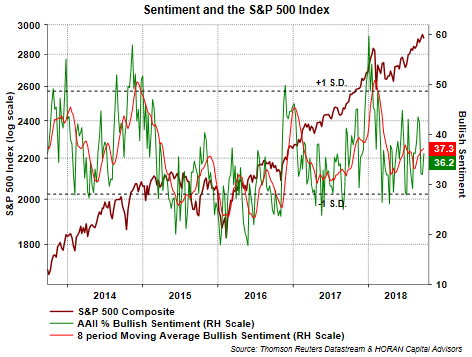 Today's American Association of Individual Investors Sentiment Survey report shows a tick higher in bullish sentiment to 36.2%. In my view, with a balanced sentiment level, relatively strong returns in the current quarter and strong recent equity inflows, this might be an environment suggestive of more positive equity inflows in the weeks ahead as well. This would serve as a tailwind for stocks all else being equal.